Ah, I see you’re looking at the bun xa! Or perhaps that’s bunh xao, ben xao, benh xa or other variations of western spelling I’ve come across. Bun xa is Ella’s favourite Vietnamese dish. Noodles, basically. Rice noodles. 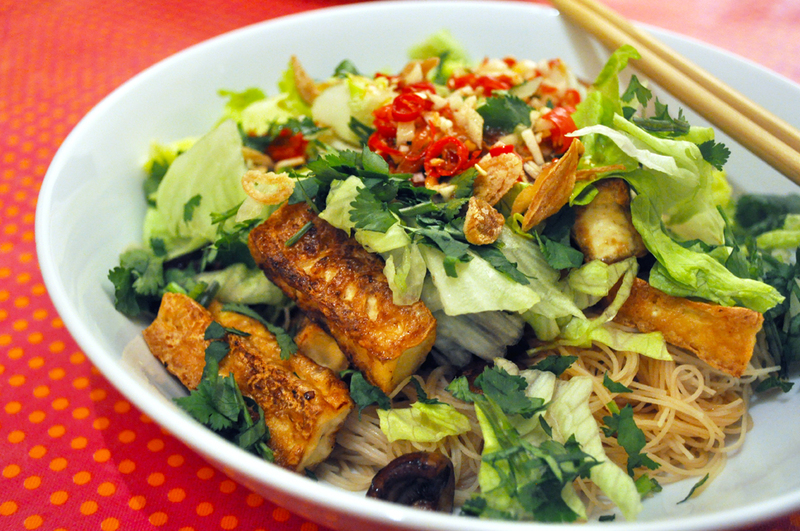 And in our case with a topping of fried tofu and salad, with a chilli dressing. It’s a dish that depends on both ‘mouth-feel’ and your nostrils: by which I mean that it should provide a range of textures in your mouth – not just mush – and both a blast of chilli and some fresh, subtle fragrance up your nose! Yep, it’s all about balance. We’ve been making this dish for a couple of years, attempting to recreate the delightful version found in a favourite Vietnamese place on Kingsland Road, East London. But we’ve never managed to get it quite right… until now. The difference this time? Sourcing ingredients from a local Asian food store, rather than trusting our supermarket’s ubiquitous brands. D’oh. Seriously, getting better quality tofu, authentic rice noodles, plus soy and rice wine vinegar – in place of the usual Blue Dragon, Amoy and Cauldron brands – really made a difference. The noodles didn’t turn to slop, the tofu crisped up nicely and the seasoning was deeper and more rounded. 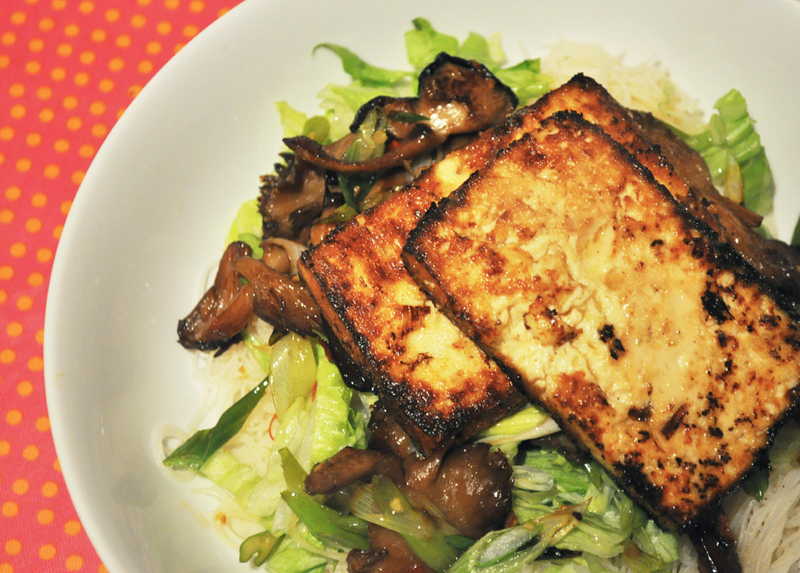 First, chop some firm tofu into bite-sized (finger-sized) pieces and fry in a single layer in a wide pan in a couple of tablespoons of sunflower and sesame oil. Add a little soy sauce to the pan as well, but don’t overdo it. 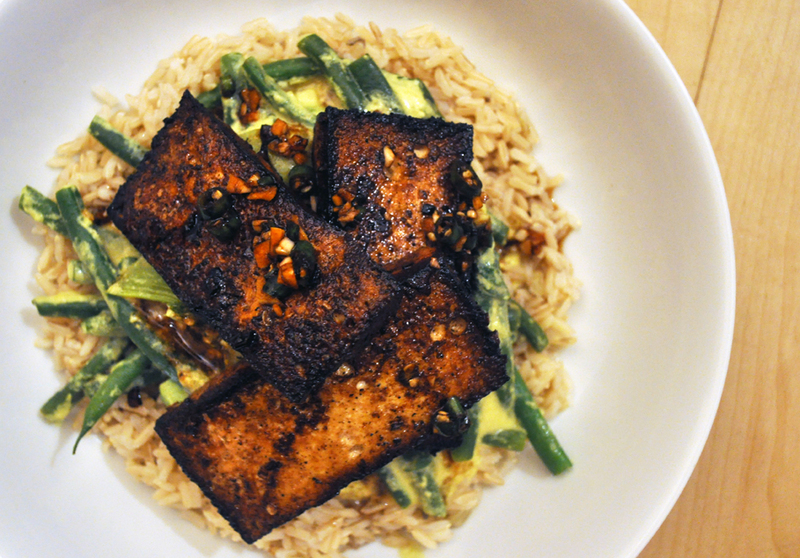 (Or marinate your tofu first, if you give yourself enough time). 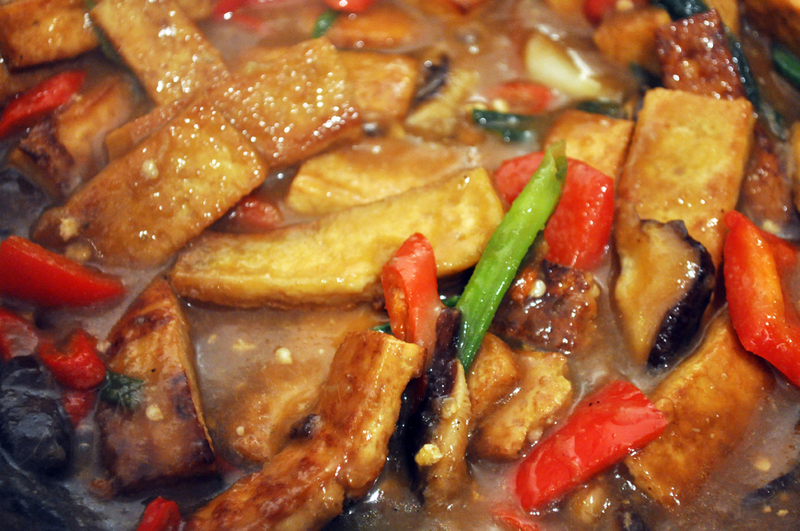 Cook the tofu gently, turning occasionally, until the tofu is golden on all sides. You can set this aside and reheat later if you need to. While the tofu cooks, get that dressing done: chop a couple of cloves of fresh garlic, a couple of chillis (ahem, or more, y’know, perhaps) and add them to a small bowl. To the bowl then add a large splash of dark soy sauce and generous glug of rice wine vinegar. Next stir in a teaspoon of castor sugar until it dissolves. Taste. It should be fiery, sharp, fragrant and with a touch of sweetness. Remember, it won’t be this hot when it’s poured over your food. Make it as bold as you dare. The rest is even easier. Plunge your fine rice noodles into a pan of boiling water, take off the heat and leave for around three minutes. Drain immediately then add a splash of soy sauce and a generous splash of rice wine vinegar to season them. Try and coat them well. Set aside with the lid covering them. 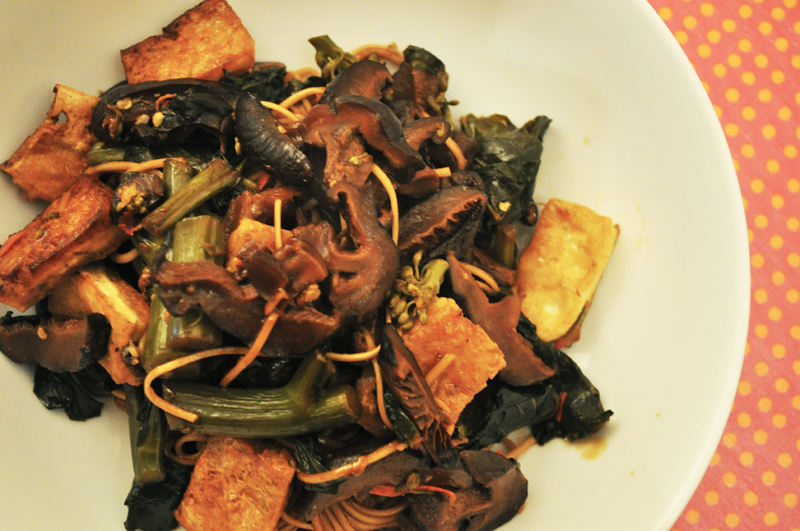 Quickly fry some button mushrooms, halved if they’re on the large side, then add them to the tofu pan. Shred some iceberg lettuce, finely slice two spring onions and coarsely chop some fresh coriander leaves. Now assemble. In the bottom of your bowl place a portion of the noodles. 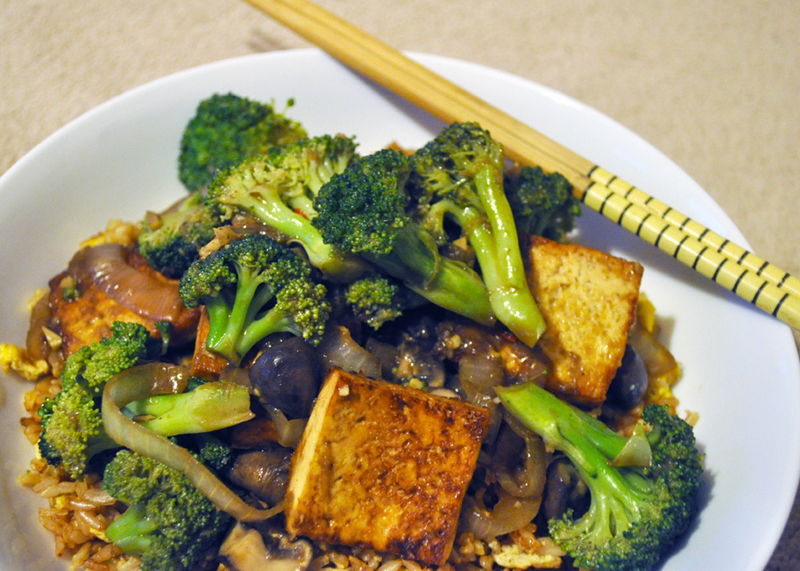 On top of that comes the tofu and mushrooms. On top of that the ‘salad’ of lettuce, onion and herbs. Then, if you can get them in your Asian grocers, sprinkle some fried shallot flakes over the dish (we really find these add a savoury depth that’s very complementary – and yes, we’ve tried making the flakes at home but they tend to remain slightly greasy and wet whereas these are dry). Serve and let people pour the dressing over the top of the dish. 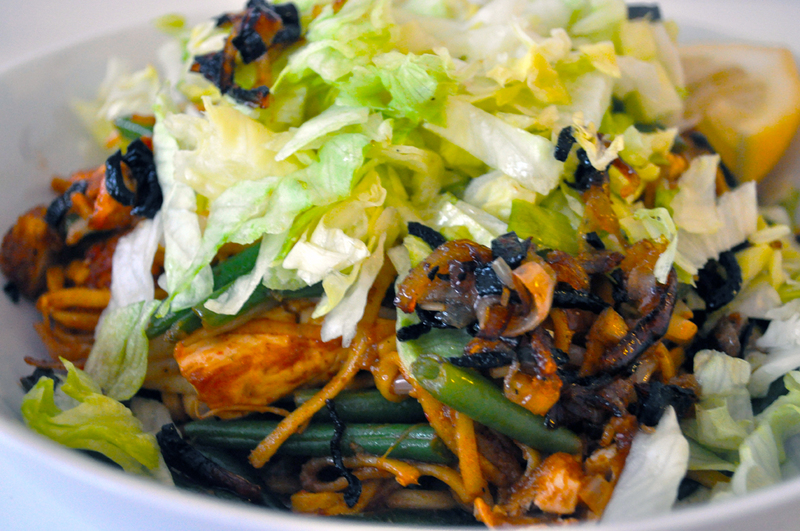 Some variations could include bean sprouts or shredded carrot in the salad. The main thing is that it is light and fresh. Chopped toasted peanuts could also be sprinkled over, as well as, or in place of, the dried shallot flakes. Get the balance right and this is as fragrant and moreish a dish as you’ll ever have. If it was music you’d be wowed by it hitting every note on the scale. If it’s greasy, heavy or bland – and if there isn’t enough chilli, then something has gone wrong. Practise this. It’s a tool for life. Honest. Okay, so this isn’t quite a ‘last night’s dinner’, it’s a breakfast based on a recipe in Denis Cotter’s For the Love of Food. Once you get the basic idea, it’s easily adaptable to your own taste. 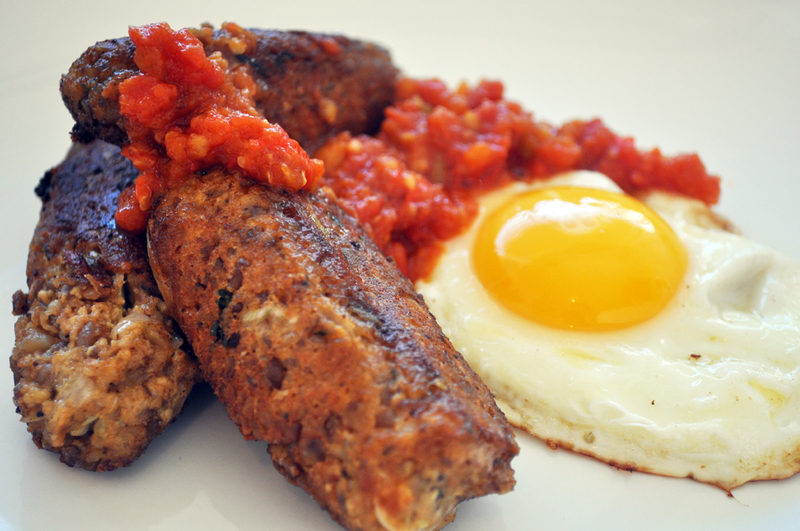 We’ve often wondered about how to make a decent veggie sausage – one that doesn’t try too hard to be meaty, one that doesn’t taste of artificial flavourings and enhancers, one that celebrates its own fresh ingredients and yet one that is defiantly sausagey. Well, this is as near as we’ve got. The principle is straight forward. It’s a mix of cooked chestnuts (a vacuum-packed bag from the supermarket is good for this), mashed tofu, breadcrumbs and herbs, all blitzed in a food processor with an egg to bind the mixture. You then take small palm-full of the mix, mould into a sausage shape and lightly fry. For Cotter’s exact ingredients see the book, but we’d happily encourage you to have a go yourselves. It’s just like making a fritter or savoury ‘cake’, but sausage-shaped and with ingredients you might not expect. Think about it, however, and it all makes sense. One tip: do be careful with them in the frying pan, unlike a Quorn sausage, or a real sausage, they do break apart fairly easily. Cotter suggests making a large batch and freezing them, uncooked. Apparently they cook better from frozen. We tried it. They did. We served them for breakfast with a fried egg and a hastily made chilli sauce (take a couple of tomatoes, some chillis, a little oil, seasoning, whizz in the food processor and cook through for five minutes). Having been so busy at work and not getting home until late, Ella was keen to do some cooking. Sunday afternoon saw her turn to Yotam Ottolenghi’s book Plenty for inspiration – where she found this recipe for Mee Goreng. Mee Goreng is Indonesian (and Malaysian) street food: noodles with fried shallots, chilli and topped with shredded lettuce leaves. There are plenty of meaty versions but we had it with green beans and tofu. A quick web search will give you an indication of just how many versions of mee goreng there are out there – it’s a make-it-up-as-you-go-along kind of thing really. Ottolenghi adds sambal olek (chilli sauce) and some ground cumin and coriander to the cooked noodles as they’re frying in the wok with with the tofu and beans. This coats them and makes them sticky – stopping it from being a straightforward common or garden stir fry. I’ve often wondered how you achieve the kind of sticky noodle that you get with, say, a good Pad Thai, and I have a feeling that, more than just the sauce, it’s the adding of the dry spice that does the trick. Any thoughts? In any case, sometimes you make a dish that’s so easy and yet also expands your repertoire. This was one of those.